One year ago I wrote a post on Which .NET framework for Windows: UWP, WPF or Windows Forms? which is still the most popular post on this site, indicating perhaps that this is a tricky issue for many developers. That this is a live question is a symptom of Microsoft’s many changes of strategic direction over the last decade, making it hard for even the most loyal developers to read the signals. UWP is our newest, leading-edge application platform. implying that if you have an unconstrained choice, this is the way to go. Yet if you look at the table of “Scenarios that have limited support”, UWP has the longest list. It is not only Windows 7 support that you will miss, but also something called Dense UI, along with other rather significant features like multiple windows and “full platform support”. What is Dense UI? 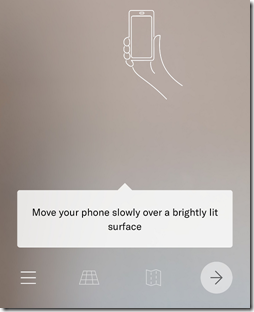 I presume this is a reference to the chunkiness of a typical UWP UI, caused by the fact that it was originally optimised for touch control. This matters if, for example, you are writing a business application and want to have a lot of information to hand in a single window. It may not be ideal for cosmetics, but it can be good for productivity. With respect to all three of these limitations, Microsoft does note that “We have publicly announced features that will address this scenario in a future release of Windows 10.” I am not sure that they are in fact fully addressed; but it is clear that improvements are coming. In fact, the promise of further active development is perhaps the key reason why you might choose UWP for a new project, that is, if you do not learn from the past and believe that UWP will still be core to Microsoft’s strategy in say five years time. Take a look at the strengths column for UWP though. Anything really compelling there? To my mind, just one. “Secure execution via application containers.” Yet the security of UWP was undermined by Microsoft’s decision to abandon its original goal of restricting the Windows Runtime API (used for UWP) to a safe subset of the full Windows API. You can also now wrap WPF and WinForm applications using Desktop Bridge, getting Store delivery and a certain amount of isolation. At the time of writing, Microsoft is still displaying this diagram in its guide to UWP. As a developer then, would you rather have PC, Xbox and HoloLens support? Or PC, Mac, iOS and Android support? If the latter, you would be better off investigating Microsoft’s Xamarin Forms framework than UWP as such. The truth is, many developers who target Windows desktop applications do so because they want to run well on Windows and are not concerned about cross-platform. While that may seem odd from a consumer perspective, it is not so odd for corporate development with deskbound users performing specific business operations. I was at one time enthusiastic about Windows Runtime/UWP because I liked the idea of “one Windows platform” as illustrated above, and I liked the idea of making Windows a platform for secure applications. Both these concepts have been thoroughly undermined, and I would suggest that the average developer is probably better off with WPF or WinForms (or other approaches to Win32 applications such as Delphi etc), than with UWP. Or with Xamarin for a cross-platform solution. That is unfortunate because it implies that the application platform Microsoft is investing in most is at odds with what developers need. If UWP becomes a better platform than WPF or WinForms in all important respects, that advice will change; but right now it is not all that compelling. Microsoft has released its financial statements for the quarter ending December 31 2018. Sometimes it seems that all the talk is of Google, Facebook, Apple and Amazon, but Microsoft continues to deliver strong results. That said, it is an increasingly corporate story. The company still has a presence in gaming, both on Xbox and PC, and reports Xbox software and services growth of 31%. Consumers still buy Windows and Office; there are now 33.3 million Office 365 consumer customers. There is no longer a PC in every home though. There might be an old one; but PCs now tend to be bought for specific purposes such as gaming or home working. There are plenty of other options for casual home computing. Windows OEM revenue is down 5%. It is a different story in the business world. Office 365 is still motoring, with revenue growth of 34% year on year. A spin-off benefit is that Dynamics 365, once a poor cousin to Salesforce for cloud CRM, now reports revenue growth of 51% year on year, despite the product’s eccentricities and high price. The key is integration and upsell: get users hooked on Office 365 for email and documents, and compelling add-ons become an easy sell. Rather to my surprise, Microsoft’s LinkedIn acquisition seems to be working. Revenue is up 29%, session numbers are up 30%. My anecdotal experience bears this out. People are actually acquiring and doing business via LinkedIn, even though it suffers from masses of bad data and the usual perils of social media (fake accounts, scammers, harassers and so on). For now, users seem to be able to manage these problems and interact with the right people. Azure revenue is up 76%. All well in Redmond then? The risk is that the company’s narrowing focus will leave it vulnerable to competitors who take advantage of their control of the end points (clients): smartphones, tablets, smart devices running Linux. Even now the web browser, with the Edge team now integrating Google’s browser engine, Chromium, rather than building their own. For now though, Microsoft powers on. A piece by Rand Fishkin tells me what I already knew: that Google has a de facto monopoly in search, and that organic search (meaning clicking on a result from a search engine that is not an ad) is in decline, especially on mobile. According to Fishkin, using data from digital intelligence firm Jumpshot, Google properties deliver 96.1% of all search in the EU and 93.4% of all US searches. “Google properties” include Google, Google Images, Youtube, and Google Maps. On mobile, the proportion of paid clicks has more than doubled since 2016. On the desktop, it has gone up by over 40%. A no-click search is one where the search engine delivers the result without any click-through to another site. Users like this in that it saves a tap, and more important, spares them the ads, login-in pleas, and navigation challenges that a third-party site may present. There is a benefit to users therefore, but there are also costs. The user never leaves Google, there is no opportunity for a third-party site to build a relationship or even sell a click on one of its own ads. It also puts Google in control of information which has huge political and commercial implications, irrespective of whether it is AI or Google’s own policies that determine what users see. My guess is that the commercial reality is that organic search has declined even more than the figures suggest. Not all searches signal a buying intent. These searches are less valuable to advertisers and therefore there are fewer paid ads. On the other hand, searches that do indicate a buying intent (“business insurance”, “IT support”, “flight to New York”) are highly valued and attract more paid-for advertising. So you can expect organic search to me more successful on searches that have less commercial value. In the early days of the internet the idea that sites would have to pay to get visitors was not foreseen. Of course it is still possible to build traffic without paying a Google tax, via social media links or simply by hosting amazing content that users want to see in full detail, but it is increasingly challenging. There must be some sort of economic law that says entities that can choose whether to give something away or to charge for it, will eventually charge for it. We all end up paying, since whoever actually provides the goods or services that we want has to recoup the cost of winning our business, including a share to Google. Around six years ago I wrote a piece called Reflecting on Google’s power: a case for regulation? Since then, the case for regulation has grown, but the prospect of it has diminished, since the international influence and lobbying power of the company has also grown. For several years the story with Office 365 was that email (essentially hosted Exchange) works great but OneDrive cloud storage, not so good. The main issues were not with the cloud storage as such, but with the sync client on Windows. It would mysteriously stop syncing and require a painful reset process to get it going again. Microsoft squashed a lot of bugs and eventually released a much-improved “Next generation sync client” (NGSC) based on consumer OneDrive rather than Groove technology. In the 2017 Windows 10 Fall Creators Update Microsoft also introduced Files on Demand, a brilliant feature that lists everything available but downloads only the files that you use. The combination of the new sync client and Files on Demand means that life has got better for OneDrive users. It is not yet perfect though, and recently I came across another issue. This is where you get a strange “Upload blocked” message when attempting to save a document to the OneDrive location on your PC. Everything works fine if you go to the OneDrive site on the web; but this is not the way most users want to work. The most popular fix for this problem is to go into OneDrive settings (right-click the little cloud icon to the right of the taskbar and choose Settings). Then find the Office tab and uncheck “Use Office 2016 to sync Office files that I open.” But don’t do that yet! If you check this thread you will see that over a thousand users clicked to say they had the same problem, and over 400 clicked to say that the solution helped them. Significant numbers for one thread. 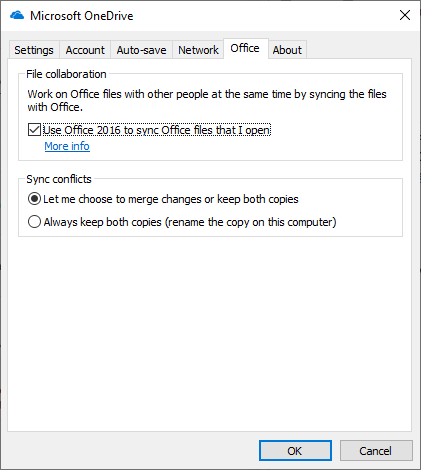 Similar to how Office opens files, saves start with the locally synced file. 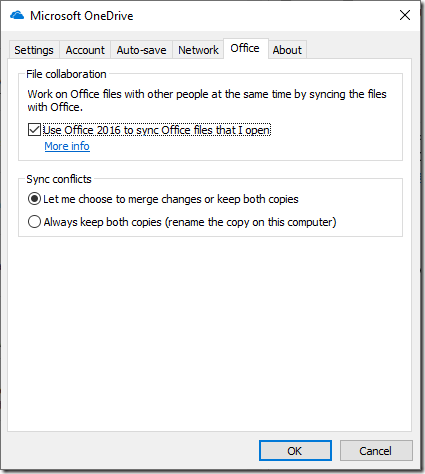 After the file saves, Office will upload changes directly to the server. 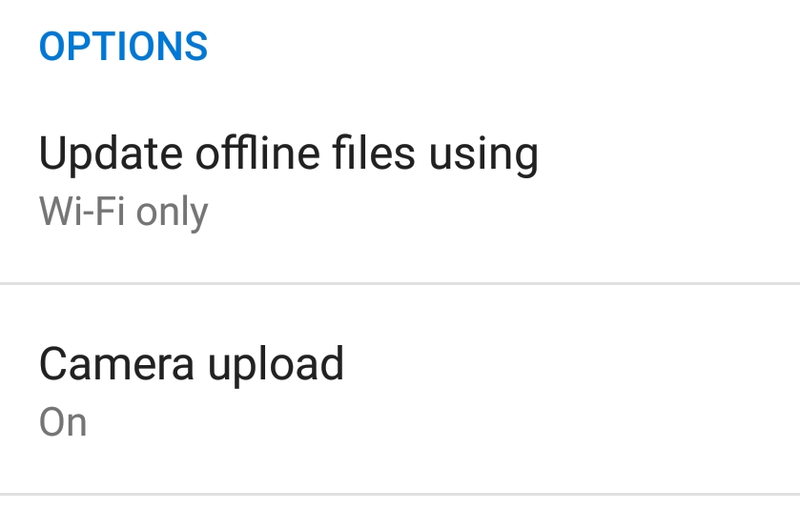 If Office can’t upload because the device is offline, you can keep working offline or close the file. 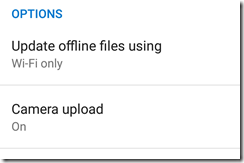 Office will continue to save to the locally synced file, and OneDrive will handle the upload once the device gets back online. In this integration, Office works directly with the files that are currently open, enabling co-authoring in Office apps like Word on the desktop, which no competitor offers. For files that are not open in Office, OneDrive handles all syncing. This is the key difference between the old sync client integration and the NGSC, and this lets us achieve co-authoring along with the best performance and sync reliability. We can conclude from this that the “upload blocked” message comes when Office (not OneDrive) tries to “upload changes directly to the server”. Office as well as OneDrive needs to be signed in. The place to check these settings in on the Account tab of the File menu in an Office application like Word or Excel. There is a section called Connected Services and you need to make sure this lists all the OneDrive locations you use. The first of these features is amazing but many people rarely use it. It depends on the way you and your organization work. The second is to my mind a bit hazardous anyway. I am not a regular at CES, the huge trade consumer technology fair in Las Vegas, but well recall my last visit, in 2014. I did the usual round of press conferences from various technology vendors, but reserved some time towards the end of my stay for the high-end audio rooms at the Venetian, one of the more civilized hotels in Vegas despite the fake canals. There was plenty of activity there, floor upon floor of exhibitors showing all kinds of audio exotica, from cables thicker than your arm to amplifiers that would test the strength of your flooring. Of course there was plenty of audio on the main CES exhibits as well, but my observation at the time was that while the mainstream manufacturers like B&W and Sony had good sounds at relatively affordable prices, the crazy folk in the Venetian did achieve the best sonics, if you closed your eyes to the wild theories and bank-busting prices. 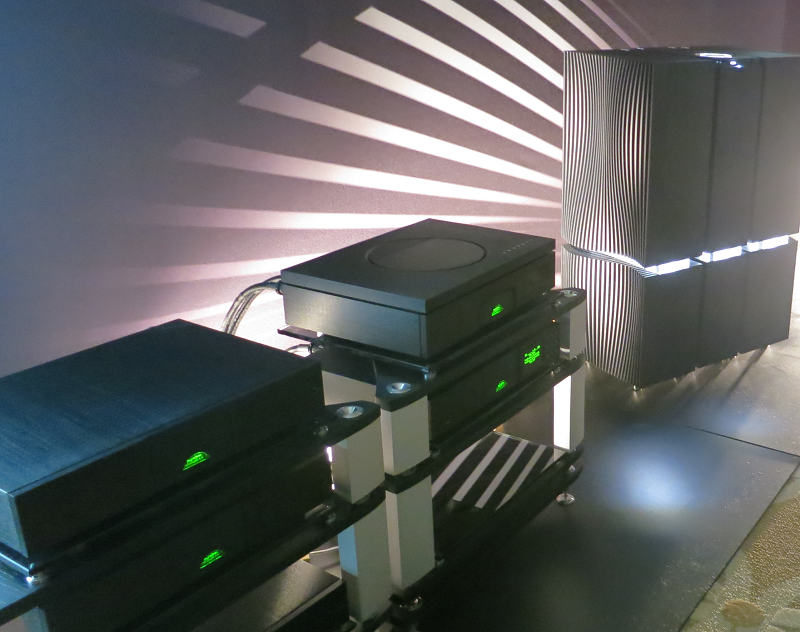 I was ushered into a room to hear a preview of Naim’s Statement amplifiers and heard a sound that was “muscular, etched and authoritative”, no less than it should be at £150,000 for a set. Maybe the writing was on the wall last year at CES 2017 when two of the suites in the high-performance area were occupied by AARP and Serta Mattress. The running joke among attendees was the elderly audiophiles there could take a nap and check in on their retirement status while listening to audio …. “This is the end of high-performance audio at CES,” said one exhibitor bluntly. The impact of the high-fidelity corner of CES was certainly diminished by any standard. Actual listening rooms were reduced to a single hallway, with some stragglers to be found a few floors upward. The word is that High-End Munich has replaced CES to some extent; but this is not just a matter of which industry show is more fashionable. You only have to look around you at a hi-fi shows to note that these enthusiasts are mostly an older generation. The future does not look good. There is no decline in music appreciation, so what is wrong? There are several factors which come to mind. The first and most important is that technology has made high quality audio cheap and ubiquitous. Plug a decent pair of headphones into the smartphone you already have, and the quality is already more than satisfactory for most listeners. Spend a bit on powered wireless speakers and you can get superb sound. In other words, the excellent performance of mainstream audio has pushed the high-end market into a smaller and smaller niche. The industry has also harmed itself by seemingly embracing every opportunity for hype, regardless of what science and engineering tell us. Exotic cables, digital resolutions beyond anything that human ears can hear, unwarranted fuss about jitter or mysterious timing issues (MQA anyone? ), and more. In the meantime, the music companies have done their best to make high resolution audio even more pointless by excessive dynamic range compression engineered into the music they release, wasting the fantastic dynamic range that is now possible and even on occasion introducing audible distortion. I became an audio enthusiast when I heard how much I was missing by using mainstream budget equipment. I recall listening sessions in hi-fi shops where I was stunned by the realism, musicality and detail that was to be heard from familiar records when played back on high-end systems. Such experiences are less likely today. I happened across Tom Warren’s list of 9 best apps for your new Windows PC and it gave me pause for thought. You may love some of those apps – Tweeten, Wox, ShareX, for example – but as it happens I don’t use any of them and it strikes me as a weak list. There are reasons for this and it is not Warren’s fault (though of course you can argue with his selection, that’s really the point of this kind of post). The most essential app for Windows is Microsoft Office. In business environments a new Windows 10 installation may only need Office, or Office and perhaps a few custom business applications, and it is ready to go. You might add Chrome or Firefox if you want to avoid Edge (I use Edge and find it pretty good), and you probably want Adobe Reader or equivalent as Edge is not that good for PDFs. There are other fantastic commercial applications of course, not least Adobe’s amazing Creative Cloud, and of course stalwarts like AutoCAD. These expensive business applications are not the kind of thing you want to list in a consumer-oriented post though. So you end up desperately searching the Windows Store for apps that deserve to be on a “best apps” list. It is not easy. The core problem is that Microsoft expended considerable energy telling developers not to bother with classic Windows desktop applications but to target the Windows Runtime, later reworked as UWP (Universal Windows Platform). Then with Windows 10 (and the abandonment of Windows 10 mobile) UWP became rather pointless. You can debate this back and forth, but the net result is that much of the life was sucked out of the Windows developer ecosystem, even though Windows remains popular. I don’t see this changing and it will not help Microsoft sustain Windows market share versus Google Chrome OS and Apple iPad Pro. From a consumer perspective, an iPad now has vastly better apps than Windows. Incidentally, my favourite free Windows apps are Visual Studio Code, Filezilla, Putty, Notepad++, Paint.NET, Audacity, Foobar2000 and Open Live Writer. And stuff I have installed in Windows Subsystem for Linux (Ubuntu) though I am not sure if that counts. The exhibition David Bowie Is, originally at the Victoria and Albert museum in London and subsequently on tour around the world, has proved an enormous success with over 2 million visitors in 12 locations. Sony Entertainment has now released David Bowie Is AR Exhibition, an app for iOS and Android that uses Augmented Reality to enable users to enjoy the exhibition at home and whenever they like. I found the app though-provoking. I am a fan of course, so keen to see the material; and I attended the London exhibition twice so I have some context. I tried the app on an Honor 10 AI – note that you have to download the Google ARCore library first, if it is not already installed. Then I ran the app and found it somewhat frustrating. When the app starts up, you get a calibrating screen and this has to complete before you can progress. If you struggle at all with this, I recommend having a look at the help, which says to “Find a well-lit surface with a visible pattern or a few flat items on it. A magazine on a desk or table works well.” Another tip is that the app is designed for a table-top experience. So sit at a desk, do not try walking around and using a wall. The app streams a lot of data. So if you are on a poor connection, expect to wait while the orange thermometer bar fills up at the bottom of the screen. The streaming/caching could probably be much improved. Once I got the app working I began to warm to it. You can think of it as a series of pages or virtual rooms. Each room has an array of object in it, and you tap an object to bring it into view. Once an object is focused like this, you can zoom in by moving the phone. Pinch to zoom should work too though I had some problems with it. 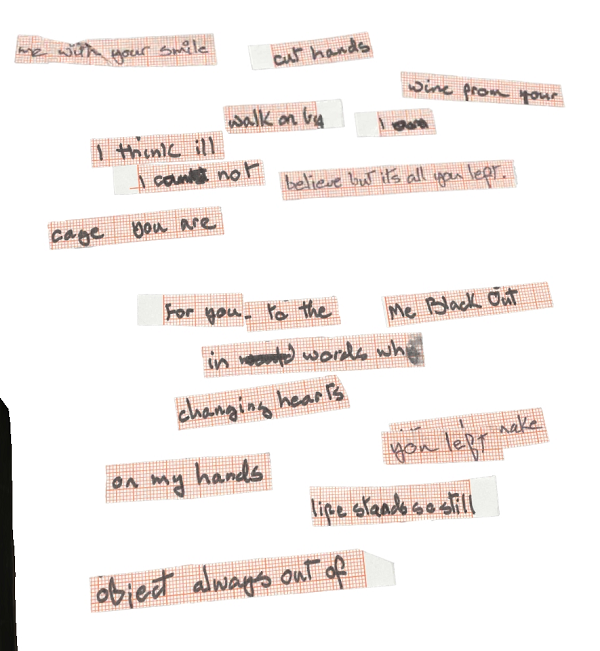 and here I’ve brought a page of Bowie’s notes into view (note the caption which appears) and zoomed in; the resolution is good. The clever bit is that you can move objects around by tap and drag. This is a nice feature when viewing Bowie’s cut-up lyric technique, since you can drag the pieces around to exercise your own creativity. Fair enough, but is this really Augmented Reality? I’d argue not, since it does not mix the real world with the virtual world. It just uses the AR platform as a viewer into this virtualised environment. The experience is good when it works, but not if you get disappearing content, endless “calibration”, stuttering videos, or content that is too small and stubbornly refuses to come into view – all issues which I encountered. It also requires a fairly high-end phone or tablet. So your environment has to be just right for it to work; not ideal for enjoying on a train journey, for example. And some of the content is literally shaky; I think this is a bug and may improve with an update. Would it be better if it were presented in a more traditional ways, as a database of items which you could search and view? Unfortunately I think it would. This would also reduce the system requirements and enable more people to enjoy it. I would love to be able to look up these items easily. Instead I have to hunt through the virtual rooms and hope I can find what I am looking for. Just like a real exhibition, complete with crowds and kids wanting toilets I guess. When I was looking for an online code repository some years back, I picked Visual Studio Online (now called Azure DevOps) over GitHub. The main reason was the ability to host private repositories with a free account. The projects I work on typically only have one or two developers. Microsoft acquired GitHub last year and has now announced free private repositories on GitHub – provided you have no more than three collaborators. You can see all the plans here. There is still a bias towards open source, in that open source developers can use the Team plan for free. This is essential for GitHub to fulfil its role as the home of many widely used open source projects. The addition of free private repositories is significant though. There are plenty of developers like myself who will now look again at hosting code on GitHub. What is Microsoft’s strategy? There seem to me two important reasons why Microsoft acquired GitHub. One was as a defensive measure. Microsoft now has a ton of open source projects that are critical to its platform, things like .NET Core and now most of the .NET frameworks as well. It would have been uncomfortable if a rival like Google had acquired GitHub. The second is to promote Azure. GitHub’s infrastructure will no doubt move to Azure, and all going well the service will promote Azure both as an example of a successful at-scale service, and by little ads and signposts that Microsoft can include. The developer audience is influential when it comes to platform choices. Microsoft therefore does not need GitHub to be profitable, which is just as well having now removed one of the main incentives to get a paid account. I will be interested to see how the company moves to further integrate GitHub and Azure DevOps. There is currently quite a lot of overlap and it would make sense to streamline the offerings to share the same back-end technology, or even to fold Azure DevOps services into GitHub. There is no hurry. Microsoft’s priority will be to keep existing GitHub developers happy and to convince them that the acquisition will do no harm. Desktop development: is Electron the answer, or a tragedy? A few weeks ago InfoQ posted a session by Paul Betts on Desktop Applications in Electron. Betts worked on Slack Desktop, which he says was one of the first Electron apps after the Atom editor. There is a transcript as well as a video (which is great for text-oriented people like myself). Electron is popular as a quick route to cross-platform desktop applications. It is particularly attractive if you come from a web development background since you can use many of the same libraries and skills. Electron is a way to build desktop applications that run on Mac and Linux and Windows PCs using web technologies. So we don’t have to use things like Cocoa or WPF or Windows Forms; these things from the 90s. We can use web technology and reuse a lot of the pieces we’ve used to build our websites, to build desktop applications. And that’s really cool because it means that we can do interesting desktop-y things like, open users’ files and documents and stuff like that, and show notifications and kind of do things that desktop apps can do. But we can do them in less than the bazillion years it will take you to write WPF and Coco apps. So that’s cool. There are many helpful tips in this session, but the comment posted above gave me pause for thought. You can get excellent results from Electron: look no further than Visual Studio Code which in just a few years (first release was April 2015) has become one of the most popular development tools of all time. At the same time, I am reluctant to dismiss native code desktop development as yesterday’s thing. John Gruber articulates the problem in his piece about Electron and the decline of native apps. As un-Mac-like as Word 6 was, it was far more Mac-like then than Google Docs running inside a Chrome tab is today. Google Docs on Chrome is an un-Mac-like word processor running inside an ever-more-un-Mac-like web browser. What the Mac market flatly rejected as un-Mac-like in 1996 was better than what the Mac market tolerates, seemingly happily, today. Software no longer needs to be Mac-like to succeed on the Mac today. That’s a tragedy. Unlike Gruber I am not a Mac person but even on Windows I love the performance and integration of native applications that look right, feel right, and take full advantage of the platform.